Hi, Pocket Page Scrappers! I have a sweet Easter Sunday layout today using the sweet March Take 10 Kits (Pocket Kit and Glam Bag) from The Studio 29 Designs, LLC. This month, when I got my kit, I had recent photos that I had printed from Persnickety Prints (love them). I distributed the cards with the best "spring feeling" pages and got to work on the first one, featuring some photos from April 2014 at our church Easter Egg Hunt. I had not printed the April 2014 photos yet, though, so these were printed with my Canon Pixma. Scroll down to see what printer I use. I just knew that a few of the cards in this kit really wanted to be paired with an egg hunt. Ha! Sequins! They have been in the last few kits and I'm loving working with them. I got out my fine tip glue and tweezers. I love the scattered look, but this time I decided to try a more structured pattern. Keep in mind that you need to be lenient with making a pattern with sequins. I kept the embellisments simple on this layout. I really like all the "white space" on the cards and wanted to keep it simple and clean. 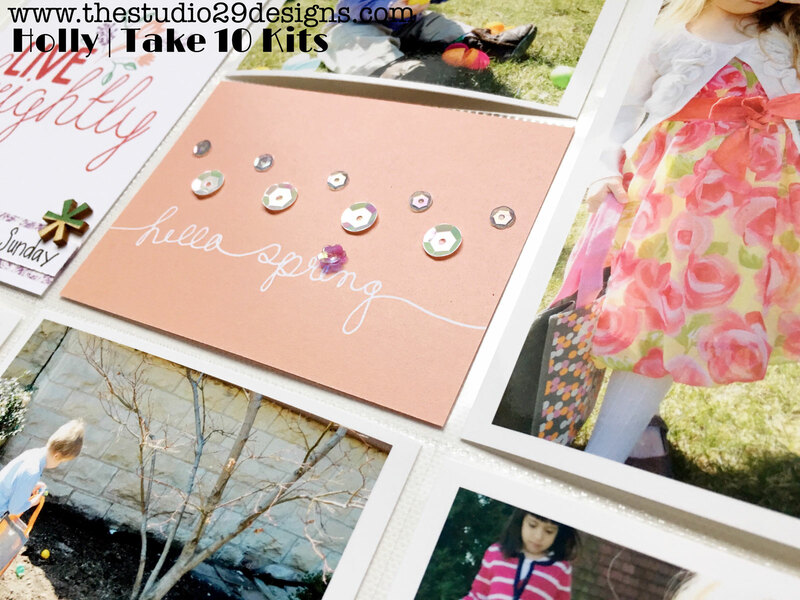 I picked a few of the PinkFresh Studio wooden embellishments that complimented those cards. For the written title, I cut the end of my washi strip into a little flag. I learned that trick from an Amy Tan online class I took! (Scroll down find that class.) I added a little strip of white cardstock with the same little notch in the end and centered it on top of the washi to write my titles. 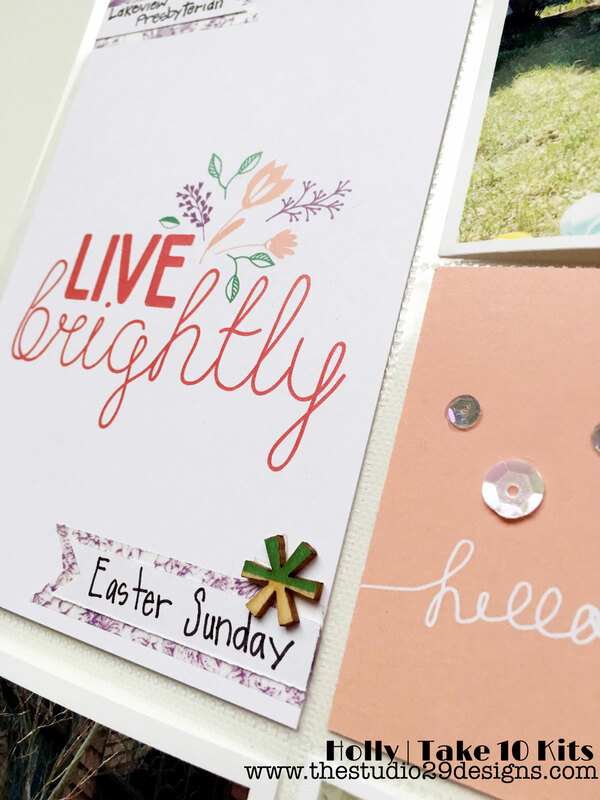 Are you using the March kit for any Easter themed pages? I'd love to see them. Holly with Painted Ladies Journal. I absolutely love this Canon Pixma! Go here for a full review on this class. It is on sale right now! 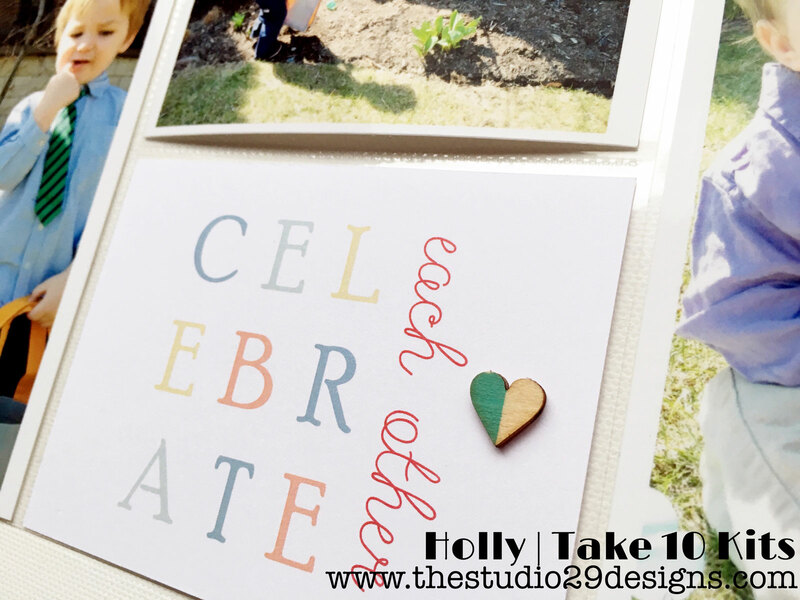 Love this layout, Holly! I agree on the 'white space, but the sequins add the perfect amount of 'special' that takes up a couple of notches.